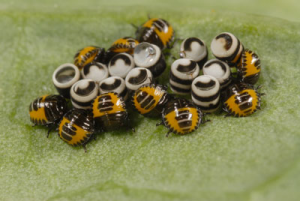 These are Harlequin Bugs. They are not beetles actually, they are stinkbugs. Hence the smell. Its very important we get rid of these, they are relatively non-toxic, but many birds find them disgusting. Which are their favorite plants? Gardens with mustards, cabbage, broccoli, cauliflower, horseradish, turnips, or arugula will likely be affected. If you see them, hand pick them and throw them into a bucket of soapy water, just like with Japanese Beetles. Alternately you can just tap the leaf to get them to fall into the water, they are not beetles and cannot fly! 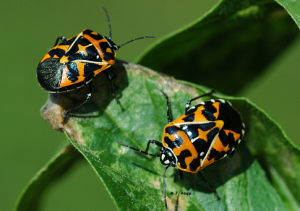 If you find several bugs on one plant, spray the affected plant with a 1% insecticidal soap solution with some neem or pyrethrin. This will kill the ones left on the plant. Kaolin clay solutions/dusting will have similar results. To make your own insecticidal soap solution, see these instructions. The nymphs (below) have a striped pattern. Treat them the same way you do adults. The most important thing however is the eggs (above). Very distinctive white barrel with black stripes. Check the bottoms of your leaves for these. Remove them, squash them, and spray the effected plant with the soap solution. Chrysanthemum produces pyrethin and repels them. Chamomile, celery, basil, garlic, mint, rosemary, and sage also may help deter them from your cabbages. They have several insect predators including the wheel bug, the sand wasp, and some parasitic wasps. Yarrow, caraway, and fennel can encourage the parasitic wasps. If you have pet turtles, chickens, or guinea fowl, they are known to eat these up. If everyone agrees to it (chickens can scratch up some plants, guinea fowl are better) we can set up a day for them to free roam and pick out a bunch of bugs. Contact leadership@rosedalegarden.org to schedule a free-roam day. At any rate, keep an eye out for the eggs!